Northrop M2-F3 The Northrop M2-F3 was a heavyweight lifting body rebuilt from the Northrop M2-F2 after it crashed at the Dryden Flight Research Center in 1967. It was modified with an additional third vertical fin – centered between the tip fins – to improve control characteristics. Grumman X-29 As strange as it is, the X-29 is one of the coolest planes I've ever seen. There were only two made for NASA as test vehicles and logged 436 flights. 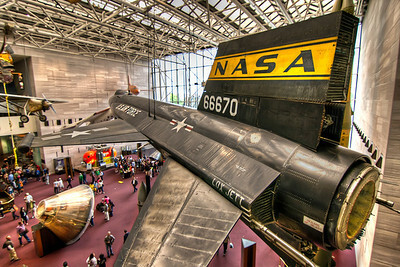 X-15 Rocket Plane Before there was a space shuttle, there was the X-15 "Rocket Plane". Much of what was learned on vehicles like this was applied to the Space Shuttle program. The Tin Goose The Ford Trimotor (nicknamed "The Tin Goose") was an all-metal, American three-engined transport plane that was first produced in 1925 by the companies of Henry Ford . Newer designs and Ford's losing interest in aviation caused production to end in 1933, with 199 airplanes built and flown world-wide by commercial and military aviation. I'm almost certain that Indiana Jones flew on one too. 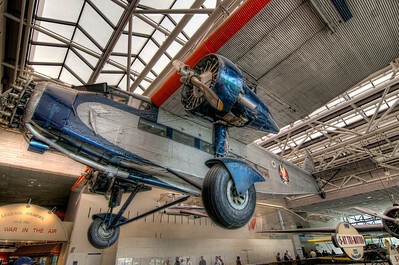 This Trimotor hangs in the Smithsonian's Air and Space Museum in Washington D.C. The Cut-Away The best I can guess, this is a cut-away on how planes are built. The color and structure of the wood attracted me to take the HDR sequence, but I didn’t notice any reference sign. Vought F4U-1D Corsair WWII had the first airplanes that people really feared, both in the air and from the ground. 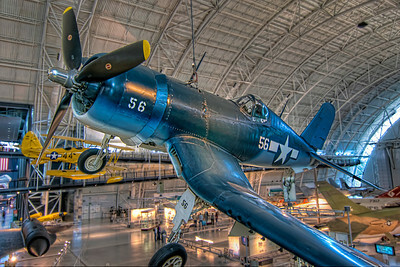 This F4U-1D Corsair is on display at the Steven F. Udvar-Hazy Center. Bede BD-5B The BD-5 is a small, single-seat, homebuilt “kit” aircraft by the now-defunct Bede Aircraft Corporation in the early 1970s. It has a small, streamlined fuselage holding its semi-reclined pilot under a large canopy, with the mid-engine and propeller mounted immediately to the rear of the cockpit. The BD-5 sold over 5,000 kits or plans. Only a few hundred BD-5 kits were completed and many of these are still being flown today. There was even a version with a jet engine, like the BD-5J from the James Bond movie Octopuss, now on display in the Pima Air and Space Museum in Arizona. I remember seeing these in magazines as a kid, so it was a treat to view this one sitting under the wing of the Boeing 307 Stratoliner. 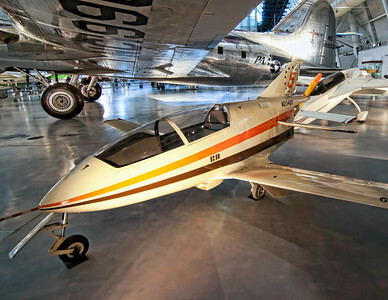 Both aircraft can be found at the Boeing Aviation Hanger at the Udvar-Hazy Center, part of the National Air and Space Museum. 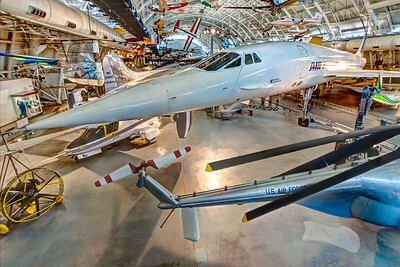 The first supersonic airliner to enter service, the Concorde flew thousands of passengers across the Atlantic at twice the speed of sound for over 25 years. The Boeing Aviation Hanger Airplanes and people have a lot in common. They come in all shapes and sizes and colors and each one excels at a particular use or purpose. 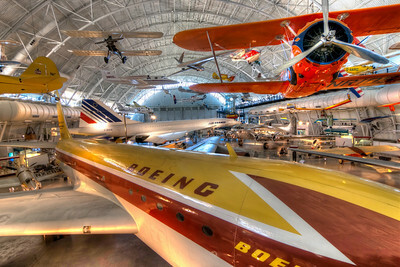 The Boeing Avaition Hanger at the Udvar-Hazy Center has a great collection of both commercial and military aircraft. The long wingspan plane at the top is the Virgin Atlantic Global Flyer. 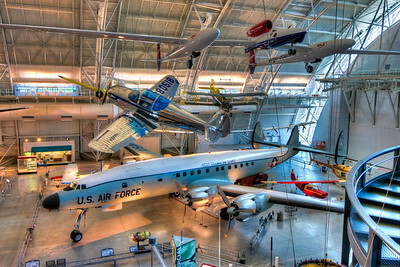 The smaller (and closer) silver model in the center is the Globe Swift GC-1a and the large Lockheed 1049F-55-96, "Constellation" sits below. I’m sorry. I couldn’t help myself. I posted a photo of this beautiful Boeing 307 Stratoliner or “Clipper Flying Cloud” almost a year ago. But it was one of my favorite airplanes at the Udvar-Hazy Center in Virginia, so I thought a closer inspection was needed so everyone could further enjoy this magnificent bird. This airplane really jumpe-started the commercial airline business, allowing more and longer flights, while the passengers enjoyed greater comfort. Of course, the fact that its polished finish looks like chrome has absolutely no bearing on why I might like it so much. Honestly. I'm sorry. I couldn't help myself. I posted a photo of this beautiful Boeing 307 Stratoliner or Clipper Flying Cloud almost a year ago. But it was one of my favorite airplanes at the Udvar-Hazy Center in Virginia, so I thought a closer inspection was needed so everyone could further enjoy this magnificent bird. This airplane really jumpe-started the commercial airline business, allowing more and longer flights, while the passengers enjoyed greater comfort. Photo by Tim Stanley Photography. 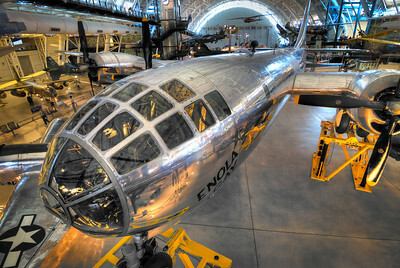 The Enola Gay The Boeing B-29 Superfortress "Enola Gay"at the Steven F. Udvar-Hazy Center near Washington Dulles International Airport. More of the Boeing Aviation Hanger This is another view of the awesome Boeing Aviation Hanger at the Udvar-Hazy Center, part of the National Air and Space Museum. 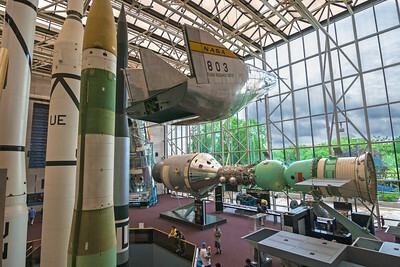 Without getting too specific, it's home of the Boeing B-29 Superfortress (Enola Gay), the prototype 707 (America's first jet airliner), a Boeing 307 Stratoliner Clipper Flying Cloud (the first airliner with a pressurized cabin) and a Concorde supersonic airliner. The sheer size and quality of the exhibit impresses everyone, whether you're a plane nut or not (there's a pun in there somewhere). If you ever fly through Dulles International Airport, take a half-day layover and take in the sights. You'll be glad you did. I’m sorry. I couldn’t help myself. 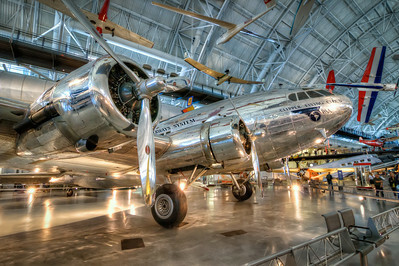 I posted a photo of this beautiful Boeing 307 Stratoliner or “Clipper Flying Cloud” almost a year ago. But it was one of my favorite airplanes at the Udvar-Hazy Center in Virginia, so I thought a closer inspection was needed so everyone could further enjoy this magnificent bird. This airplane really jumpe-started the commercial airline business, allowing more and longer flights, while the passengers enjoyed greater comfort. Of course, the fact that its polished finish looks like chrome has absolutely no bearing on why I might like it so much. Honestly. I'm sorry. I couldn't help myself. I posted a photo of this beautiful Boeing 307 Stratoliner or Clipper Flying Cloud almost a year ago. But it was one of my favorite airplanes at the Udvar-Hazy Center in Virginia, so I thought a closer inspection was needed so everyone could further enjoy this magnificent bird. 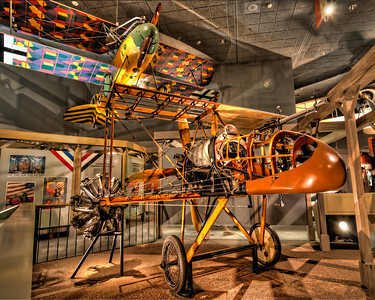 This airplane really jumpe-started the commercial airline business, allowing more and longer flights, while the passengers enjoyed greater comfort. Photo by Tim Stanley Photography.